M&StL, the Luey, was a Granger Road. Merged into the C&NW and now part of the UPRR family. 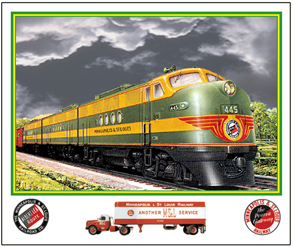 M&StL operated one of the most colorful diesel fleets in railroading. Featuring one of the beautiful Minneapolis & St Louis F-unit diesel freight locomotives with Peoria Gateway logo on the back. 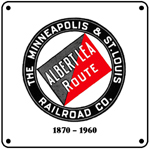 6 inch x 6 inch square tin sign with the Minneapolis & St Louis Railways Albert Lea Route Logo. 6 inch x 6 inch square tin sign with the Minneapolis & St. Louis Railways Peoria Gateway logo. Powerful EMD freight diesels in one of the M&StL Railroads many color schemes.